New Investigation Finds U.S. Special Forces Massacred Somali Civilians & Orchestrated a Cover-Up | Democracy Now! an independent journalist based in Mogadishu, Somalia. AMY GOODMAN: The Pentagon is on the defensive, after a new investigation revealed evidence that U.S. special operations forces massacred civilians in Somalia earlier this year, allegedly firing on unarmed farmers and their families, then planting weapons beside the bodies to appear as though the people were armed members of al-Shabab. This statement came after The Daily Beast published an investigation Wednesday on the Bariire operation and its aftermath and reported what eyewitnesses have said since the attack: The victims were farmers, they were killed by American soldiers, they said. AMY GOODMAN: In fact, after the attack, hundreds protested, and survivors refused to bury their dead until the Somali government apologized and withdrew allegations that they were members of al-Shabab, and reportedly paid the victims’ families as much as $75,000 each. All of this comes as the U.S. recently revealed it has some 500 troops in Somalia, up from a reported 50 earlier this year. And on Thursday, the death toll reported from a massive truck bomb attack in Mogadishu in October rose from at least 350 to 512. Christina, thanks so much for being with us. You interviewed several survivors, as well as the Somali army commander in charge of the Somali soldiers who assisted in the operation, and also Somali intelligence officers, local leaders and government officials familiar with this attack. Can you lay out what you found? What happened this past summer? CHRISTINA GOLDBAUM: Yes. So, as you said, after this operation happened, there was a big uproar in Somalia. People were protesting in a town nearby to where this happened. The families also refused to bury their dead until the Somali national government admitted that they were civilians, as you say. And so, after that happened, I began looking into what exactly had happened in that operation. This investigation included over two dozen interviews of people who knew about it and people who were eyewitnesses. And what I found is shocking in two ways. The first is that AFRICOM, or the U.S. Africa Command, often says that U.S. soldiers on the ground in Somalia and elsewhere in Africa are doing advise, assist—and now they’re starting to say accompany—missions. And they will have the public believe that in the course of these operations, U.S. soldiers are not in the line of fire. They are simply advising and assisting local forces. And so the first thing that shocked me in the course of this investigation was learning that, in fact, U.S. soldiers who were part of this mission were on the front lines. They were firing, in addition to the Somali National Army soldiers, at these civilians. And we learned that from looking at the shell casings that were found and were immediately collected after this operation happened, and immediately brought to Mogadishu, again, because these farmers are civilians, and they wanted to make that clear. So that, I think, is one thing that is very important to note, because, again, U.S. Africa Command will have the American public believe that U.S. soldiers are not in the line of fire, and this clearly demonstrates that that is not the case. The second kind of interesting fact about this is that—you know, Somalia is an incredibly complex environment. You have al-Shabab militants in rural areas, but then you also have a lot of clans who are in—who have rivalries and are in conflict with each other. So you also have a lot of farmers, pastoralists, who are armed, to protect their resources, to protect their camels, to protect their farmland, from rival clans and rival clan militias. And what became clear to me in the course of this investigation was that the U.S. special operators who had carried out this operation didn’t quite understand that dynamic in the course of planning this operation. They had approached the Ugandan Defense Force’s contingent commander as a part of the African Union peacekeeping force, and his purview includes Bariire. And he had actually advised them against doing this mission. When he said that he would not offer his soldiers, they instead went to a Somali National Army brigade that had not been trained by U.S. soldiers, as some Somali National Army brigades have been. 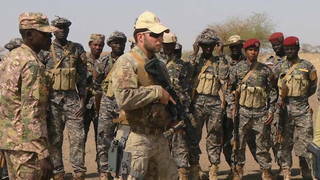 The U.S. is there training Danab, which is a special forces unit of the Somali National Army. So they approached the Somali National Army to help them with this operation. It became clear that they were getting information from that leader of that brigade of the Somali National Army, who is a former al-Shabab commander. They were also getting information from a militia leader who is in direct rivalry to the clan of the farmers who were killed. And in addition to that, they were also using a translator who had—they had used in a different operation a year ago in central Somalia, in north-central Somalia, that had resulted in the death of 10 people who were not al-Shabab. They were in fact from a local militia that the U.S. had been working alongside. And so, it seems as if those three individuals, in particular, perhaps others, had misled the U.S. forces, and that those U.S. forces had not sufficiently vetted the information that they were getting about who these farmers are. I also learned, from talking to the farmers who had survived this operation, that they had approached the Somali National Army commander multiple times in the week prior to this operation happening, to let him know that they did have arms but they were not al-Shabab, that the arms that they had were to protect them from a rival clan who they believed were going to attack their farm. And they wanted to make clear to the American special operators they knew were now in this town nearby that they were simply farmers, and they were armed, but that did not mean that they were al-Shabab. And yet, that information was clearly not conveyed to these U.S. special operators. And again, I don’t think that the information that they were getting in the lead-up to this operation had been sufficiently vetted. And again, if you read that AFRICOM statement, that came out just after I published this investigation with The Daily Beast, they’ll remind you that they take every precaution to try to protect civilian lives. And I would say that in this operation, that’s not the case, that this information was not sufficiently vetted, which is why 10 farmers, including one child, was killed in the course of this operation. AMY GOODMAN: So this happened, Christina Goldbaum, on August 25th, this past summer. Explain what the people did then with—well, what the soldiers did, and which soldiers did this, laying weapons out next to the dead bodies. CHRISTINA GOLDBAUM: Yes. Yes. So, when the farmers approached the Somali National Army commander, he had instructed them—and he told local media this immediately after this incident—he had instructed them to place their weapons in a house. That way, that if there was drone surveillance, they wouldn’t be confused for al-Shabab, because they wouldn’t be carrying arms. So, on those instructions, these farmers placed their weapons in a house. It was a part of this farming village. And after they were killed, after they were shot and the survivors were brought to the scene where some of their fellow farmers were shot, they saw the Somali National Army soldiers go into the house, on the instruction of U.S. special operators, collect the weapons that had been inside that house, and then place them next to the bodies of the farmers who were killed. And then they saw the three U.S. special operators taking photos of their bodies. Now, it’s important to note that usually if there is a firefight and a weapon is displaced—maybe it’s thrown a foot or two away from an enemy who was killed—that it’s not unusual for a soldier to take that weapon and place it next to the body of that person killed before taking a photo, to demonstrate that they are an enemy combatant. However, these weapons were not displaced on the battlefield in the course of a firefight. These weapons were in a home, on the instruction of the Somali National Army commander. And it seems to me, you know, seeing the Somali National Army soldiers collect them from this house, where they had been stashed, and place them next to the weapons, it’s directly misleading. You know, taking a picture of a farmer who was killed with a weapon that was in a house and not—he was not firing back in the course of this operation—to try to prove that he is an al-Shabab militant, you know, that is directly misleading. And I think one thing that shocked me, again, in the course of this investigation is the seemingly kind of cover-up of what happened, from placing these weapons next to the bodies, to diplomats in Mogadishu pressuring the Somali government to hide the findings of their own investigation into this incident, which proved that these people were civilians. And because of that investigation, because the Somali government knows that they are civilians, that’s why they paid these families at least $70,000 in the aftermath. And they would never do that if these people were al-Shabab militants. AMY GOODMAN: So, the amount of money you’re talking about, you’re talking about each family got something like $70,000? Where did the money come from? CHRISTINA GOLDBAUM: I talked to a number of government officials who gave me the figure between $60,000 and $70,000. At least one of those government officials believed that that money is actually coming from the United States. That’s only one person. I haven’t confirmed that. But that is his strong belief, that part of—again, in the aftermath of this, part of the U.S. diplomats pressuring the Somali government to not publish the findings of their investigation was kind of quietly paying these families as compensation for what happened. Again, that’s one source. But it is clear that at least—that these families were paid in the aftermath of this event, which, again, would never happen if they were al-Shabab combatants. You would never have protests like you did if they were al-Shabab combatants. And you would never have al-Shabab bringing the bodies of those killed to Mogadishu and refusing to bury them, if they were al-Shabab. That would be absolutely unprecedented, and I can’t see any reason why al-Shabab would do so. AMY GOODMAN: And the idea that the villagers took the bodies of the dead to Mogadishu to prove that they were civilians, that they were not al-Shabab, Christina? CHRISTINA GOLDBAUM: Exactly. I mean, again, there has never been any incident in Somalia where al-Shabab brought their own militants to Mogadishu and refused to bury them. That would be absolutely unprecedented, and I cannot see any reason why al-Shabab would do that. The reason that this happened—you know, the elders of this particular clan were, again, pressuring the Somali federal government to admit they were civilians. The fellow farmers who survived were pressuring them to do the same, because they were being told that they were al-Shabab militants, when they are not. So, again, that’s never happened. And again, I cannot see any reason why al-Shabab would bring their militants to Mogadishu, or why hundreds of people would protest this. It’s become, I think, very clear in Somalia that these people are civilians, which is why the AFRICOM statement saying that their investigation found that they were enemy armed combatants—and note they don’t say “al-Shabab,” they say “enemy armed combatants”—is really troubling. To me, that would—that makes me think that perhaps, you know, it’s again this kind of cover-up of saying, “No, no, no. You know, these people were firing back at us,” which they’re simply—you know, in the course of my investigation, this is not the case. AMY GOODMAN: And finally, Christina, I want to ask you about a bombing that took place two months later, almost two months later, when—now the numbers have been adjusted to over 500 people killed in the twin bomb blasts in Mogadishu October 14th. Can you talk about—is there any link between these two? CHRISTINA GOLDBAUM: There isn’t a link between these two. There was an article that came out in the aftermath of that bombing that alleged that one of the suicide bombers was somebody who had been radicalized after that operation. What happened is that about a month after the incident where the farmers were killed, al-Shabab went to the town nearby, which the Somali National Army soldiers were attempting to hold from them, and retook the town, killing about 40 Somali National Army soldiers in the course of that. And after that happened, which was at the end of September, that entire area now is yet again in the hands of al-Shabab. So it’s possible that the suicide bomber came from that area, but if so, it’s only because al-Shabab retook the town nearby and perhaps sent one of their militants from that town to Mogadishu to carry out that tragic bombing. AMY GOODMAN: Christina Goldbaum, I want to thank you for being with us. Last question: What directly has the Pentagon told you, in your reporting, on both the massacre and what you’re alleging is a U.S. Pentagon cover-up? CHRISTINA GOLDBAUM: I spoke to them a day before my article came out, and they had told me that the investigation was still ongoing. So, to me, it’s very suspicious that 30 minutes after my article was published, that they have come out to say that the investigation has finished and that they have found that they were not civilians who were killed. So, again, that was 24 hours before this article came out, and the DOD was telling me that the investigation was still ongoing. It was undergoing a credibility assessment then. AMY GOODMAN: Christina Goldbaum, thank you so much for your incredible reporting, independent journalist based in Mogadishu. Her new article for The Daily Beast is headlined “Strong Evidence That U.S. Special Operations Forces Massacred Civilians in Somalia.” We’ll link to it. We’ll link to The Daily Beast piece at democracynow.org. Christina was joining us today from Nairobi, Kenya.